Swing is an American art form most commonly attributed to recording giants Frank Sinatra, Count Basie, Duke Ellington, Mel Torme, Ella Fitzgerald and beyond. In his biography it explains, Steve Lipman’s debut recording comes from his love of this era and the respect he gained through listening to such classic artists as these, but it was one artist in particular that influenced Lipman the most and it is the chairman of the board himself. Lipman by day runs a busy Dentistry practice in Windsor, CT., but his love of the standards is a passion he incorporates into his daily routine, in fact, he has been dubbed the singing dentist. “Fly Me to the Moon” features Lipman’s own swaggered phrasing, backed by a traditionally swinging ensemble, the sound of nostalgia is heard throughout. Trumpeter Josh Evans takes a wonderful solo with a warm and inviting tone, Lipman’s ending is an unexpected treat. “My Way” a signature song for Sinatra is sung with sincerity towards Lipman’s inspirational icon. 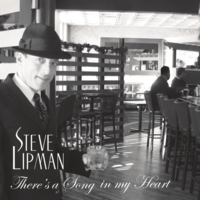 Lipman certainly is doing it his way, living life, singing music that speaks to his heart and keeping the vintage sound of the classic era alive through his dentistry, gigs and now his debut recording, There is a Song in My Heart.